The rift and quartered board will only shrink in thickness and will remain stable in flooring, millwork, furniture or cabinetry applications. It is the best option for the radiant heated floors and critical applications. In general it is a superior choice to minimize seasonal gaps, buckling etc. It has stability rivaling engineered floors and longevity of the solid wood floor - that what makes rift/quartered sawn flooring the best choice for discriminating buyer. Quartersawn (Quartered and Rift) White Oak is prized for flooring, millwork, furniture and cabinetry for its stability and beauty. Quartered White Oak exhibits pronounced Medullary Ray or Ray Fleck, which becomes even more pronounced when the wood is finished. 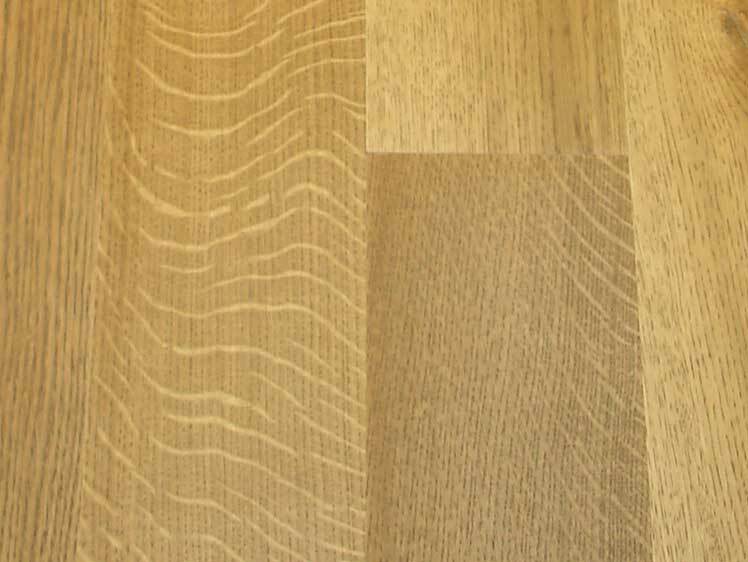 Rift White Oak exhibits less Medullary Ray or Ray Fleck, while maintaining the same straight grain appearance as Quartered. 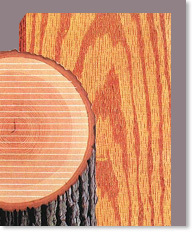 Quartersawn boards all share a common characteristic - the grain pattern on the face is straight grained. 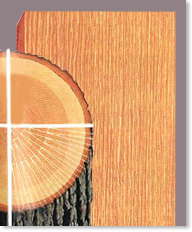 In the Oaks, when the growth rings are 60-90° to the face of the board, the Medullary Rays are exposed to maximum visual effect. These rays are present in all trees, but most prominent in the Oaks. These rays are called "figure", "flake", "ray fleck", "tiger stripe" or "fleck". Typical and most economical choice is to purchase mixed - Rift and Quartered sawn boards, typically referred as R/Q. You can also choose Rift Only or Quartered Only boards if looking for specific appearance of the grain. We will hand select boards with majority certain grain appearance. Please note that it is impossible to sort out 100% Rift or Quartered Only board. Some Rift boards for example may still have "flakes" on one end of the board with the rest of the board being majority Rift cut. In Quartersawn White and Red Oak, a visual distinction is made between "quartered" and "rift". is known as "ray fleck", "figure" or "ray". growth rings at a 60-90 degree angle to the face of the board. 30-60 degree angle to the face of the board. Common Characteristics of "Quartered" and "Rift"
while maintaining a consistent appearance across the face of the board. 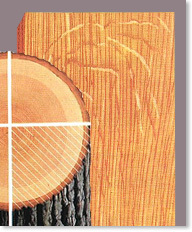 Quartersawing is a slower process that involves cutting from the inside outwards, turning the quarter log "cant" end for end and cutting alternate faces. This method is more labor and technologically intensive, yielding slightly narrower boards, but with greater strength, stability and character than plainsawn. The leading North American mill - Frank Miller Lumber Company, Inc. offers good explanation of the process in this video.